643 pages | 192 B/W Illus. Quality Management and Improvement includes discussions about lean thinking, process control, and access to services. Patient Safety and Managing Error looks at reactive and prospective error management techniques. Methods to Assure and Improve Quality deals broadly with techniques to monitor, assure, and improve quality. People and Quality focuses on human factors, changing roles, staffing, and training. Quality Assurance in Radiotherapy addresses the general issues of quality assurance with descriptions of the key systems used to plan and treat patients and includes specific recommendations on the types and frequencies of certain tests. Quality Control: Equipment and Quality Control: Patient-Specific provides explicit details of quality control relating to equipment and patient-specific issues. Recently, a transformation of quality and safety in radiotherapy has begun to take place. Among the key drivers of this transformation have been new industrial and systems engineering approaches that have come to the forefront in recent years following revelations of system failures. This book provides an approach to quality that is long needed, one that deals with both human and technical aspects that must be the part of any overall quality improvement program. it goes well beyond [quality assurance tests] and tackles quality at the highest levels of management and strategy. 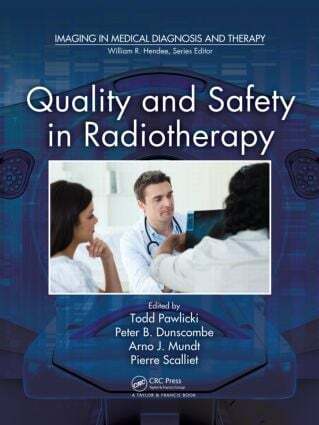 Virtually every aspect of quality and safety in radiotherapy is dissected … it serves as an excellent starting point and contains many references for further reading. I can therefore see this book being an extremely useful first reference for any manager wishing to review their current quality management practices. It is up-to-date in terms of technology and the latest thinking on quality management programmes, and contains several practical case studies and worked examples. …perhaps it is time for all of us to re-think our quality programmes, and this book would certainly be a valuable starting point. The contents and layout are excellent. …well written and easy to read. Because of its comprehensive nature, students as well as seasoned radiation therapy professionals will find this book useful. … No one book contains the range of topics covered in this book. There are books devoted to quality assurance of radiotherapy devices which go into much more detail on each device. There are books on quality management, human factors engineering, and error prevention which are not written in the context of radiotherapy. In this book, the authors provide a brief review of all these topics with enough detail to convey the salient points needed to understand the fundamentals. Each chapter includes a wealth of references which readers can use to supplement the material in this book. This is an important reference on critically important topics. Todd Pawlicki and Arno J. Mundt work in the Department of Radiation Oncology at the University of California, San Diego. Peter Dunscombe works in the medical physics department at the Tom Baker Cancer Center. Pierre Scalliet works in the Department of Radiation Oncology at the St. Luc University Hospital.